Equipment is approximately 74” wide (load side) x 137” deep x 352” overall height. Lower half of equipment framework is 6” square x ¼” wall structural tube; upper half of equipment framework is 4” square x ¼” wall structural tube, all welds continuous. Continuously welded tubular bracing on frame for added strength and rigidity. 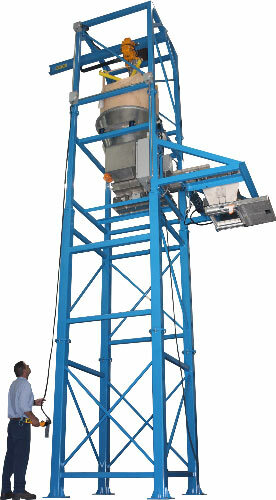 1-ton Harrington electric chain hoist with motorized trolley and nylon energy chain package. Unit features an open-top surge hopper for loading and discharging a duffle bottom bag. Surge hopper features an operator access door for untying bottom of bag. Unit features a vibratory feeder and batching hopper. Batch hopper features a gain-in-weight scale system, material agitator, and a roller slide gate. NEMA 4 operator control panel features a panel mounted digital weight indicator with a 4-20mA output signal for feeder control.